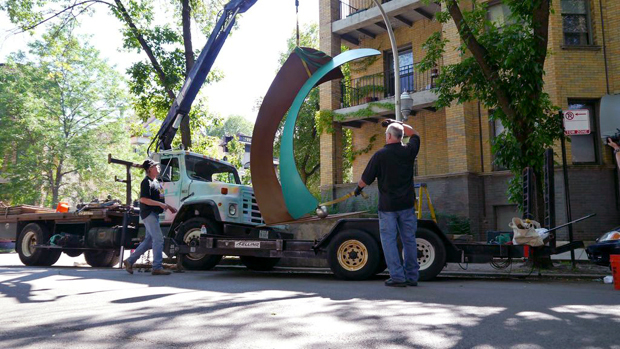 Chicago artist Ron Gard and a crane operator place a new sculpture, titled A Night in Tunisia, on the corner of Elaine Place and Roscoe Street. Artist Ron Gard is an artist from Bucktown who is participating in the program. Former Alderman Vi Daley, left, is the founder of the Chicago Sculpture Exhibit. 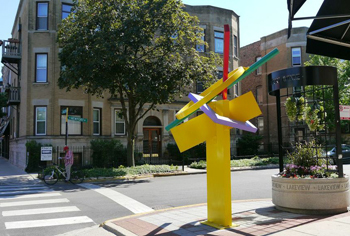 Artist Ray Katz' sculpture Branches was installed on the corner of Newport and Halsted. Ald. Tom Tunney of the 44th Ward was on hand for the installation. Toward the end of last year, Lakeview lost three animal friends that had been a part of the neighborhood for nearly thirty years. Now, the city is making its first attempt to fill the empty art shoes left on the corner of Elaine Place and Roscoe Street as part of a broader effort to expand public art in Chicago. On Tuesday, a silver-haired man stood next to one of the empty podiums on Elaine Place. Rigged to his truck was a large metal sculpture. Between the glances at his cellphone and a hurried conversation with his friend, it was clear that he was waiting for something. “The crane’s late,” he said. That man is Ron Gard, a longtime resident of Chicago and a Bucktown-based sculptor. 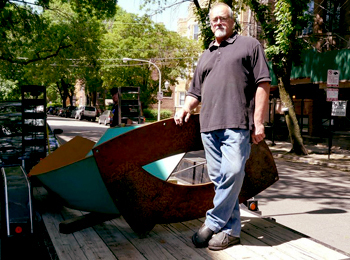 Gard stood by his truck, waiting for the crane that would hoist the turquoise metal hulk to it’s new home once occupied by a chrome giraffe, one of a celebrated pair created by Chicago artist John Kearney. Those giraffes, along with their shiny sister, a nanny goat, were removed near the end of last year. The sculptures were an integral part of the neighborhood, dressed up like school mascots on holidays and special events. The sculptures gained so much notoriety that some residents created Twitter feeds and Four Square check-ins for the pieces. Gard’s work, titled A Night in Tunisia, is part of the Chicago Sculpture Exhibit. That effort is also responsible for new sculptures on Broadway and Roscoe Street as well as Newport and Halsted. “This is a great program and it offers the artist the opportunity to expose their work and have an opportunity for someone to fall in love with it and maybe buy it," said Gard. The Chicago Sculpture Exhibit was founded 12 years ago by former 43rd Ward Alderman Vi Daley. The sculptures in Lakeview are part of 24 new pieces public art that the CSE will be installing this summer. Almost every piece is by a local Chicago artist selected by a jury in an annual “Call for Artists”. The crane finally rumbles onto Elaine Place. Gard and the crane driver began the tedious task of placing the sculpture on the concrete podium as curious passersby stop to observe the scene. 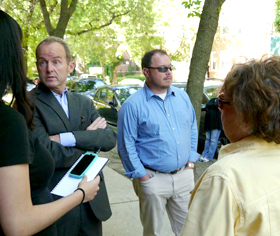 Among the onlookers: Ald. Tom Tunney (44th) and CSE founder Daley. The Chicago Sculpture Exhibit began in Lincoln Park in 2001. The program expanded to Lakeview and until last year consisted of only eight public art pieces. Now, the program is exploding three-fold into five wards with 24 sculptures. Tunney hopes the program will expand to more neighborhoods. The CSE is publicly and privately funded, not unlike Millenium Park. 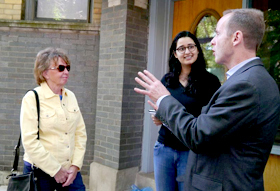 The aldermen of each participating ward recruit corporate sponsors, such the Northalsted Business Alliance, Chicago Cubs, Chicago Apartment Finders. According to Tunney, the installations cost their corporate sponsors $3,500 per a year. The giraffes that once occupied the corner of Elaine Place and Roscoe Street were privately owned by Milton Zale, who sold a chunk of nearby property to Chicago Apartment Finders. The sculptures weren’t included in the sale. Zale told DNAinfo it would cost $90,000 to return the sculptures. The removal sparked controversy among tourists and residents of the area, many of whom, thought the sculptures were publically owned pieces of art. Jon Pound is the executive director of Chicago Public Art Group. His group has been producing large-scale art projects in the city for the last 40 years and advocates for the increased visibility of art in public spaces. In this case, that ownership took the form of residents dressing the giraffes in rainbow boas and festive hats during the annual Gay Pride Parade, which is only 11 days away. Simran Khosla is a WBEZ intern. Follow her @simkhosla. Email her at skhosla@wbez.org.